← Spotted: The “T”MI Girl is Back! Many thanks to Deirdre Byrne for inviting me to the Red Sox/Tampa Bay game last night (and many thanks to her boss for giving her his tickets)! The rain held out, it wasn’t too cold, the seats were great, and I am now a proud owner of a Fenway Park souvenir cup, which holds about 18 gallons of soda . As you know, I’m a native New Yorker, and I pride myself on being a Yankees fan. 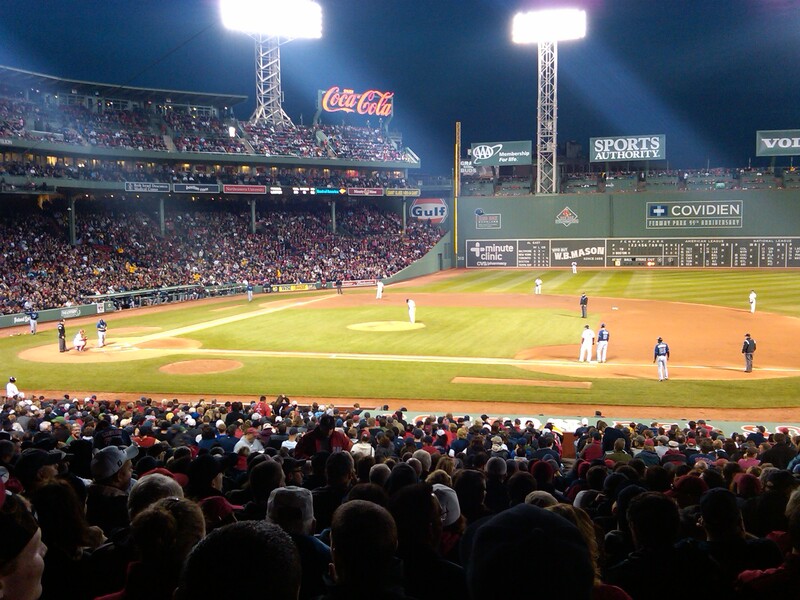 But you can’t deny there is something special about going to a baseball game at Fenway Park. While going to Yankee Stadium is an event of epic proportions, going to a Red Sox game is like walking down to the neighborhood ballpark to play catch with your friends. I use to live in the shadow of Fenway Park, and I sometimes would walk over there for no reason. The place just feels like its own little village, trapped in some faraway time. “The only things that matter in life are second floor Walsh and the Mods.” All nod their heads in agreement. If you didn’t go to BC, you can’t possibly comprehend that conversation, but I can safely say I’ve had it before and it’s spot on. Baseball, rain and drunk BC kids partying out the end of the semester. Spring has finally sprung.